The Minamata Convention adopted on October 10 is a big step forward in phasing out the use of mercury—a silvery, odourless element that earned Victorian hatmakers who used it the name of mad hatters. The highly toxic element debilitates people and causes dementia and other diseases. The international conference organised by the United Nations Environment Programme (UNEP) at Minamata city in Kumamoto, Japan, aims at curbing the health and environmental damage caused by the element. Ninety two countries signed the treaty to phase out the use of mercury and mercury-based products by 2020, and over the next five years, the signatory countries will invest in developing mercury-free solutions. The convention also decided to set up a Global Environment Facility Trust Fund with an investment of US $10 billion for research and development. While experts have welcomed the Minamata treaty, they believe it might not be enough to check the use of mercury. Satish Sinha of Toxic Links, a non-profit working on hazardous wastes, says while the convention saw for the first time countries with opposing foreign policies coming together to sign a treaty, “there is a long way to go”. Sinha points out that although the treaty calls for phasing out of certain products, there are no emission targets for important industries. The treaty leaves it to the signatories to fix emission targets, he says. While it draws a timeline for phasing out a range of products, including batteries, clinical equipments, cosmetics, the treaty has not specified any date or timeline to stop the usage of mercury in artisanal and small-scale gold mining (ASGM) and coal-fired power plants, the largest emitters of mercury. UNEP stated on October 12 this year that ASGM and coal-fired power stations are the biggest sources of mercury pollution worldwide. Miners inhale mercury during smelting and mercury that runoff contaminates fish, the food chain and people downstream. About 727 tonnes of mercury is annually emitted from ASGM operations, especially in western Africa. Anti-hazardous chemicals campaigners such as International Plaster-of-Paris and Elimination Network (IPEN) are also unhappy with the convention’s outcome. “Minamata-like tragedies are already taking place in areas surrounding ASGM sites, though most are hidden from public view. However, provisions to address mercury pollution through ASGM are very weak (in the convention treaty). For example, the current text allows import of unlimited quantities of mercury for use in ASGM with no phase-out date,” says Olga Speranskaya, co-chairperson at IPEN. Close to 2,000 people died in Minamata city due to the release of methyl-mercury in the industrial wastewater by a chemical factory between 1932 and 1968. The toxic chemical bioaccumulated in shellfish and fish in Minamata Bay and the Shiranui Sea, which, when eaten by the people, resulted in mercury poisoning. Next only to ASGM, coal burning for power and other industries contributes about 475 tonnes of mercury to the manmade emissions. According to a UNEP report this year, the mercury content of coal varies widely, introducing a high degree of uncertainty in estimating mercury emissions from coal burning. However, the Minamata treaty only calls for the usage of best available emission-control technologies in new power plants, boilers and smelters. “For the existing and older plants, the signatories have been asked to determine emission targets,” states the treaty. “Many countries are rapidly expanding their national electricity generating capacity, including construction of many new coal-fired power plants. The treaty’s proposed provisions will not likely result in a reduction of the number of coal-fired power plants in operation or even slow their growth,” said Speranskaya in a letter to UNEP, adding that for developing nations the treaty does not come into effect for the next 10 years. Days after the treaty, the World Health Organisation and Health Care Without Harm—a campaigner for mercury-free health devices— launched the Mercury Free Healthcare by 2020 campaign. The treaty calls for a ban on usage of mercury by 2020 in certain medical and monitoring devices, including barometers, thermometers, hygrometers, manometers and blood pressure monitors. However, the treaty exempted vaccines containing thiomersal, an anti-septic and anti-fungal preservative which has mercury. While the US and Europe had phased out the vaccine preservative about 15 years ago, thiomersal was at the centre of the debate between health activists during negotiations at the Minamata Convention. “The continued use of thiomersal is unjustifiable and phasing out its use in all products globally should be expedited. It is unethical and unjust to continue exportation of thiomersal-containing products to less developed countries from countries that no longer accept its use,” says Eric Uram, executive director at SafeMinds, a US-based health advocacy group. UNEP has also exempted the usage of mercury for ritualistic and religious purposes after Nepal objected to the inclusion of mercury for spiritual purpose under the phase-out list. Even the Hispanic and Yoruba communities in the US and the Caribbean consume mercury for ritualistic purposes. Nepal’s representative at the convention, Govinda Prasad Kharel, undersecretary and senior environmental engineer, has told the chair of the Intergovernmental Panel for Negotiations in Geneva that strong religious beliefs are attached with mercury, so it should be allowed to be used for religious purposes. Nevertheless, the treaty has been taken seriously by 138 nations, who approved of the convention in October. The treaty states that signatories have 10 years to phase out mercury completely, a period, Sinha believes, will be crucial as stakeholders will have to find innovations to phase out anthropogenic emissions of mercury. India did not attend the diplomatic conference that was held at Minamata city in Japan to adopt the mercury treaty on October 10. Alok Saxena, chief engineer at Central Electricity Authority, who represented India in the final negotiations on the mercury treaty at the Geneva Conference, said that though India approves the treaty, it wants a Montreal Protocol-like arrangement to phase out mercury. The Montreal Protocol to protect the ozone layer had a provision to set up a fund to help developing nations phase out ozone-depleting substances. India is the second largest emitter of mercury after China. 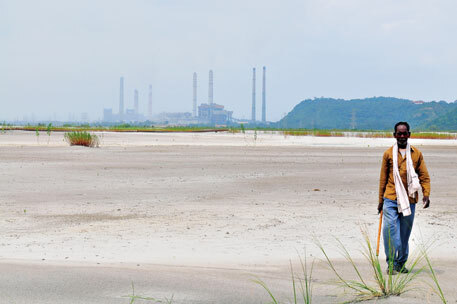 Estimates prepared by researcher Ragini Kumari of Toxic Links in 2007 show that 90 per cent mercury emissions in India come from coal used by power plants and allied industries. With no emission standards in place for mercury, India is promoting several coal power plants which emit mercury. Recently, the Central Pollution Control Board (CPCB) found that the power project in Singrauli in Sonbhadra district of Uttar Pradesh, which is considered to be the next powerhouse of India, has become a health hazard. In 2012, CPCB analysed 11 coal samples from Singrauli and found mercury concentration in coal ranging between 0.09 parts per million (ppm) and 0.487 ppm. In 2011, Delhi-based non-profit Centre for Science and Environment (CSE) found 0.15 PPM mercury in coal at Anpara village of Sonbhadra district. CSE’s findings show that a 1,000 MW thermal power plant is emitting at least 500 kg of mercury every year in Singrauli alone. Use of mercury in coal-powered power plants, smelters and boilers.